Before every Thanksgiving Day I visit the local ice cream shop to pick up their seasonal special ice cream, pumpkin. But lately, when visiting the shop I have enjoyed the frozen yogurt varieties offered. And while planning my menu these last few days I have decided to come up with my own version and serve it with a pumpkin seed brittle. What else will I to do with all those pumpkins I recently brought home the other day? I have been getting up early every morning to roast two pumpkins a day, peel and puree and freeze them for my holiday recipes and pies. But, you can use canned organic pumpkin for this recipe. Try this recipe anytime at home as it recreates all the Fall flavors we all crave this time of the year! 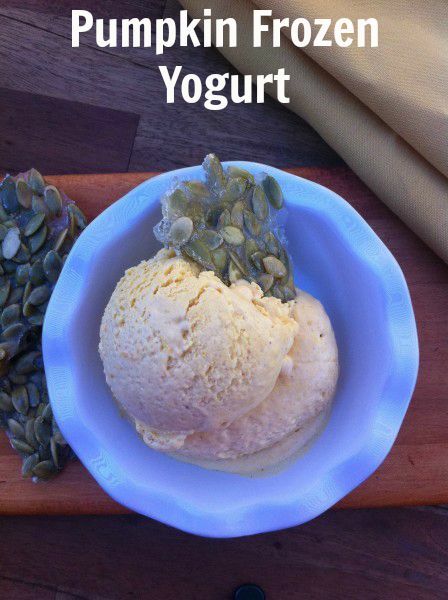 A nice ending to any meal this frozen Greek yogurt has a bit of a pumpkin pie taste, with it's autumn spices. Switch this out for pie and enjoy it's Fall warm flavors. Combine 1 cup heavy cream, 1 cup whole milk, and ½ cup sugar in a heavy saucepan. Whisk 3 large egg yolks and remaining ¼ sugar in a large bowl until blended. Gradually add hot cream to the egg mixture and whisk to blend. Return mixture to the saucepan and stir over medium heat until custard thickens slightly and coats the back of the spoon, or instant thermometer reads 170 degrees. Pour custard through a strainer and let cool slightly. Whisk in yogurt,salt,vanilla,nutmeg ,and cinnamon. Refrigerate until custard is well chilled. Transfer to a an ice cream maker and process until thickened . Place in a freezer container. Cover and freeze until ice cream is firm. Place a large 24x12 inch sheet of parchment paper on a work surface or a sheet pan. Bring sugar,water and salt to a boil in a 2-quart heavy saucepan. Cook mixture without stirring,washing down any crystals from side of the pan with a pastry brush dipped in cold water. Cook until mixture reaches soft ball stage of 238 degrees. Remove from heat. Stir in seeds with a wooden spoon and continue stirring until syrup crystallizes. Remove pan from heat and cook, stirring until sugar melts and turns a deep caramel color. Carefully pour caramel onto parchment paper and carefully cover with another sheet. Roll out candy as thin as possible. Remove paper and cool. Break into pieces. Greek yogurt can be found at Trader Joe's,Whole Foods and check your local supermarket. If unavailable, place regular yogurt in a cheesecloth lined strainer, place in a large bowl, cover and chill overnight to drain. The trick is to make sure it coats the back of your spoon when you run your finger across the spoon. Then it’s ready to pull off the heat. I pulled the yogurt out of the ice cream maker when I sampled it and it was thick and creamy. Stir the seeds until the sugar crystallizes. Return to the heat until a deep caramel color. This is just beginning to turn- watch it carefully and pull it off the minute it changes or you’ll burn it. Let it rest and cool. Then break into pieces and store in an airtight container up to a week.